ELECTRA is a new generation of Shape-Based Autorouting software for PC boards. By contrast with traditional gridded maze autorouters, a shape-based approach allows for more efficient use of routing area and is more suited to handle complex design rules requirements of high density SMD or through holes boards and achieve the highest route completion rates. ELECTRA uses an effective multi-pass cost-based conflict reduction algorithm to find a routing solution adapting to the natural flow of the nets. Adaptive routing algorithm is the only proven approach to reach high completion rate on today’s complex PCBs. ELECTRA provides immediate feedback on the routing progress and conflict reduction rate. Shape based autorouting with adaptive multi-pass conflict reduction technology. Interactive Contour Router with Push and Shove. Pattern Router for fast, esthetical results and in average 20% less vias. Handles complex PCB designs with timing conditions such as min/max length, match length and differential pair constraints. Active flow with controlled autorouting of preselected interconnects. PCB CAD plug-in, Specctra DSN format support. - Shape based autorouting with adaptive multi-pass conflict reduction technology. - Interactive Contour Router with Push and Shove. - Pattern Router for fast, esthetical results and in average 20% less vias. - Handles complex PCB designs with timing conditions such as min/max length, match length and differential pair constraints . - Active flow with controlled autorouting of preselected interconnects. - Reasonable Cost of ownership. 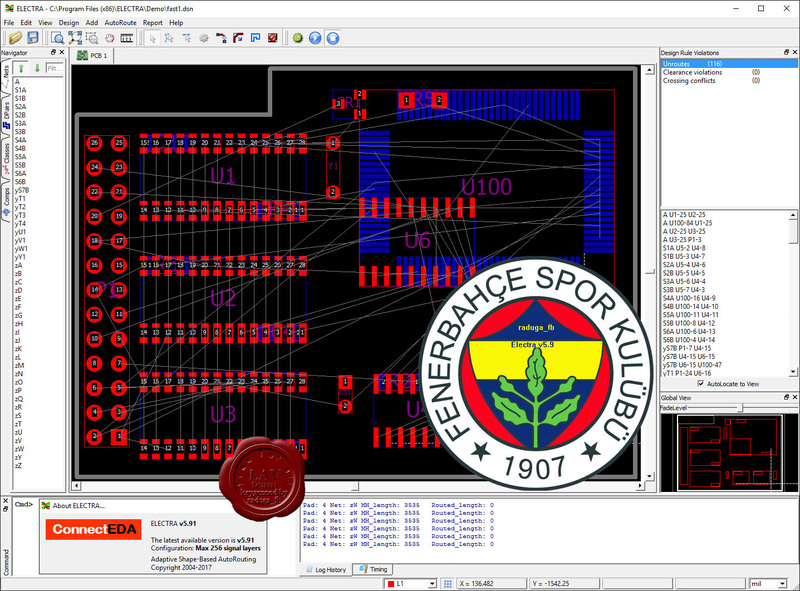 - PCB CAD plug-in, Specctra DSN format support.